What's Wrong With My Junk? There is an old saying that “one person’s junk is another one’s treasure.” After a recent yard sale and seeing what people were buying from my household rejects, I can see that this must be a true statement. I mean, these were the things from the back of closet shelves, tops of cabinets and shelves, old dirty and worn tools and yard machines, coffee mugs and shot glasses from every casino and tacky tourist town in the country and linen patterns that went out of style in the early 1970s when I was in college. People bought food processors without any blades and tacky silk flower arrangements that should have been thrown away as soon as they were made. They were lining up to buy this stuff…. and actually paying me money. It still astounds me. Seven hours later, the dregs of the junk were left. 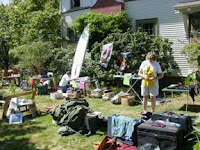 The clutter that even the most ardent and die-hard yard sale customer would not buy…not for a dollar…. or marked down to fifty cents…. not even when finally moved down to the quarter table. As I loaded the trunk of my car with these items to take to a local charitable outlet, I thought over the day and the items that sold and those that did not. Obviously, in this case my junk was also someone else’s junk, too. There are days that I wake up and realize that I don’t spring out of bed as quickly as I did ten years ago. If I were to spring like that, my knees and hips would probably rebel and I would end up in some pretzel position on the floor that would be difficult to explain to the EMT staff when they arrived. I find myself making the “grandfather sounds” when I try to stand up from the sofa or recliner. You know, that kind of groaning “Oy” sound that involuntarily comes from deep within. The aging process is beginning to take it’s ugly toll on me and I am beginning to feel a little junkish myself at times. Where I am heading with all this is the point that in God’s eyes there are no dregs or leftover junk. It doesn’t matter whether we are skinny or overweight, tall or short, married or single. He doesn’t care about our ethnic background, rich or poor, balding or like Rapunzel in the tower. We are all equal in God’s creation and even though we may disappoint Him when we do not live as He asks, that does not change His love toward us. So, take joy in your diversity and your eccentricities. You are part of God’s world and he will never love you any less. That’s why God never has a yard sale; He loves everything He has. And for that, I am eternally grateful. I used to have a picture of a man trying to crawl out of a swamp with alligators surrounding him on every side. The caption read “When you are up to your a** in alligators, it’s difficult to remember your objective is to drain the swamp.” Somewhere in the midst of a moving homes or offices, the picture has been lost, but the humor and truth stay with me. Can you imagine that man’s thoughts when his boss told him to go out and drain the swampland, but when he started the job the alligators began to come out from all their hiding places. Places the man did not see until he began his work. Once they began to converge on the man, the only thing he was thinking of was getting out of the swamp and away from those ‘gators. Forget the swamp and what he was supposed to be doing. He felt the threat crawling all around him. Stop for a minute and think about the objectives we all have in life. A good career, the best car, a family that makes you proud, friends and neighbors who invite you over for steak dinners, the latest iPod, and the list can go on and on. All of a sudden one day an alligator crawls into your space and the wonderful job decides to outsource your department, your car turns out to be from a hurricane sale, your spouse leaves you, and (horrors) the iPod breaks down. Where are your objectives now? As Christians, we live by basically simple instructions. To love and respect God, treat your neighbors as you want to be treated and to share God’s message of Love through Christ with others. However, many times you have to meet them in their neighborhoods where they live, work and play that may not be in the most desirable parts of the county. Many other times, our neighbors are cranky, crotchety, hateful people who toss their dog droppings over the fence into your yard. Our children seem to hate us for making them eat vegetables and do homework and they think that the absent parent is better and cooler than you. Each month you have to decide between paying the cable company, the water bill or giving to your church. One little, two little, three little alligators. Creeping up on you and distracting you from what you know you should do. How can I love God when my world seems so stinky? How can I treat my neighbors with respect when they are “not our kind of people?” How can I share God’s message of Love to others when I really don’t like them because they treat me like junk? How many alligators are nibbling at your “feet”? Have you forgotten your objectives because of the sounds of the creatures advancing from all the hiding places in your life? Do you feel like your world is spinning out of control because you are in a swamp and cannot get out quick enough? Stop, sit down, go to your quiet place and listen to the voice of God bringing you back to him and giving you the strength to battle the alligators of your day. I can promise that with God’s strength, you will win the battle.